Condition: Intact. In use as a lighthouse. Ownership / Access: Northern Lighthouse Board. Notes: Kinnaird Head (Scottish Gaelic: An Ceann Ard, "high headland") is a headland projecting into the North Sea, within the town of Fraserburgh, Aberdeenshire on the east coast of Scotland. The 16th-century Kinnaird Castle was converted in 1787 for use as the Kinnaird Head Lighthouse, the first lighthouse in Scotland to be lit by the Commissioners of Northern Lights.Kinnaird Castle and the nearby Winetower were described by W. Douglas Simpson as two of the nine castles of the Knuckle, referring to the rocky headland of north-east Aberdeenshire. Both buildings are category A listed buildings. Kinnaird Castle, also known as Fraserburgh Castle and Kinnairdshead Castle, was begun in March 1570. The builder was Sir Alexander Fraser, 8th laird of Philorth, (c.1536-1623), who also transformed the fishing village of Faithlie into the burgh of Fraserburgh in the 1590s. However, the building of the castle led to such expense that he was forced to sell Philorth Castle, the family home. Alexander, 10th of Philorth, fought for the king at the Battle of Worcester (1651). Despite being badly wounded, he survived to live into his eighties. In 1669 he inherited the title of Lord Saltoun, and in later years he had apartments at Kinnaird Castle The last people to reside in the castle were Henrietta Fraser (1698-1751), daughter of the 12th Lord Saltoun, and her husband John Gordon of Kinellar (1684-1764). 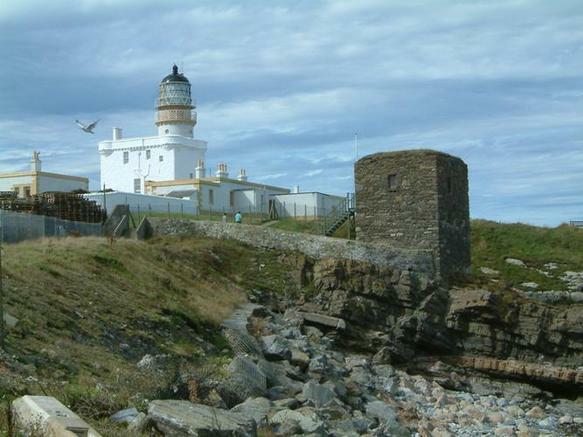 In 1787 it was leased to the Trustees of the Northern lights, who turned it into Kinnaird Head Lighthouse. Designed by Thomas Smith, the lamp was first lit on 1 December. The structure was rebuilt in the 1820s, and superseded by a new lighthouse in 1991.It now houses the Museum of Scottish Lighthouses, which incorporates the original lighthouse and a modern building housing collections of lenses and other artefacts from many lighthouses across Scotland.